Stainless steel corrosion resistance (PREN) calculator - Stainless steel corrosion resistance (PREN) calculator - formula & step by step calculation to find the corrosion resistance of various stainless steel by using the PREN values (Pitting Resistance Equivalent Number). PREN = C + 3.3 x M + 16 x N. Chrominum C, Molybdenum M & Nitrogen N in percentage are the key elements of this calculation. The more PREN values indicates that the metal has more higher corrosion resistance. The values more than 32 indicates that the steel has seawater corrosion resistance. The below mathematical formula is used in strength of materials to find the corrosion resistance of various stainless steel by using the PREN values. Besides, the step by step calculation for each calculation performed by using this calculator let the users to know how to perform PREN values calculation. In the field of mechanical engineering, while working with strength of materials, it's sometimes important to analyse the corrosion resistance of stainless steel. 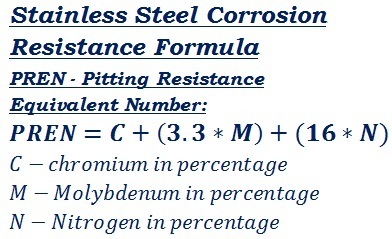 The above formula & step by step calculation may be useful for users to understand how the values are being used in the formula to find the PREN (pitting resistance equivalent number) values, however, when it comes to online for quick calculations, this stainless steel corrosion resistance calculator helps the user to perform & verify such mechanical engineering calculations as quick as possible.